With the right business continuity strategy, you can mitigate the impact of a disaster and keep operations running. Today, we share some simple tips to help you do it. When is the Atlantic hurricane season? June 1 to November 30, which is the most common period for tropical storms to form in the Atlantic Ocean. Who is affected? All businesses located along the East coast and Gulf of Mexico. Remember: hurricanes can cause destruction hundreds of miles inland, not just along the coastline. 40% of companies go out of business after major disasters like hurricanes. But this is preventable by having a good backup plan, in every sense of the term. Here’s what you need. If you can do nothing else on the list below, then at least have a plan for how everyone will stay connected during a major communications outage. This alone won’t save the company from a hurricane. But it will at least enable communication to keep moving forward, which is especially critical when there’s no other backup plan in place. Consider how people will get updates on what’s happening and what to do next. Make sure major stakeholders know who to get in touch with, and how. In the event that your primary location is destroyed or inaccessible, you need to have a backup. For the smallest businesses, this could be a cramped office where select employees can run critical operations from a few computers. For larger businesses, it could be a large, reserved space for backup manufacturing, warehousing, logistics—whatever it takes to keep the business running. The key is to have this backup location available and ready to be used at a moment’s notice, year-round. What good is a backup location if you don’t have any equipment for it? Consider what resources your critical staff will need to maintain operations. These could be computers, phones, servers, networking infrastructure, or even office furniture. If your critical operations can be performed from any computer (and a physical backup office isn’t viable), then enable workers to perform their key responsibilities from home. If your most important applications aren’t cloud-based, then you’ll probably need a virtual private network (VPN) for employees to access systems remotely. That also assumes your network infrastructure is operational and unharmed by the hurricane. Hopefully this goes without saying, but you need to put employee safety above all else. Whether the hurricane strikes during normal hours of operation or not, everyone should know what to do, long before the storm arrives. They should know whether to evacuate, where to seek shelter if needed, where to access emergency aid and whom to contact if they need help. Finally, never create policies that put people in harm’s way. Hurricanes aside, you should already be backing up your data! For most businesses, data has become invaluable: company files, emails, CRM data, production data, finance data, application data—the list goes on and on. Losing access to your data, even for just minutes, can be devastating. Every business needs a dependable backup and disaster recovery system (BDR) that can back up your data frequently and recover it rapidly when needed. On-site backups are ideal because they offer the fastest recovery time. But what if the server room is literally under water? Let’s hope you have another backup stored somewhere else. If losing your data would be a nightmare, then you can’t store it all in a single vulnerable location. Make sure your data is being backed up to the cloud, in addition to your on-site storage devices. This will ensure you can still recover your critical files and keep the business running, even if your on-site infrastructure has been flooded. We’ve mentioned enabling VPN to allow remote workers to work from anywhere. But you can take this a step further by making your entire data backup accessible via a virtualized environment. For example, Datto’s BDR systems create image-based backups that are fully bootable virtual machines. This allows you to spin up a backup in seconds, so you can continue accessing critical apps and data, from anywhere, while the full recovery is in progress. And since backups are also stored in the cloud, it won’t matter if your on-site systems are inaccessible. If your data center is in the hurricane’s path, then your data is still vulnerable. Hopefully your data center has several safeguards in place for such scenarios, so that it can withstand a Category-5 storm, even if power and telecommunications lines are knocked out. But what if the data center did go down? Is your data accessible somewhere else? If you’re backing up to the cloud—whether it’s your own private cloud or a public cloud—you must make sure the data is being replicated to a secondary site—ideally one that’s in another region, unsusceptible to hurricanes. Just because a hurricane is coming doesn’t mean your server room needs to be destroyed. Fire suppression systems and flooding sensors, among many other solutions, can greatly reduce the risk of damage to your IT infrastructure. Let’s imagine the storm is dying down, and some staff are returning to help with business-critical operations. Well, if Internet is out, there’s probably not much they can do. These days, a steady Internet connection is a must for most businesses. If your ISP or telecommunications company has an outage, then you’re at their mercy. Who knows when they’ll be able to restore it? Consider deploying an always-connected device, like the Datto Networking Appliance, which has 4G LTE Internet failover. All your on-site tech is useless if there’s no power. And after a major hurricane, electricity might not be restored for days or even weeks. Don’t take the chance. If you live in an area that is prone to hurricanes (or other major storms, for that matter), then you should be using backup generators. You might not need to power the entire office—just the most critical systems. If you’re leasing office space, be sure to ask if generators are on-site or the feasibility of adding them. The hurricane hit. Now what? If you want to recover quickly, you need a specialized team to make it happen. A disaster recovery team is made up of employees who will survey the impact of the event and oversee the recovery process. For example, certain team members might be tasked with inspecting IT systems and recovering data backups, while others might assist with relocating workstations from a flooding space to a dry one. Your recovery team is essential for keeping the recovery on track and efficient. 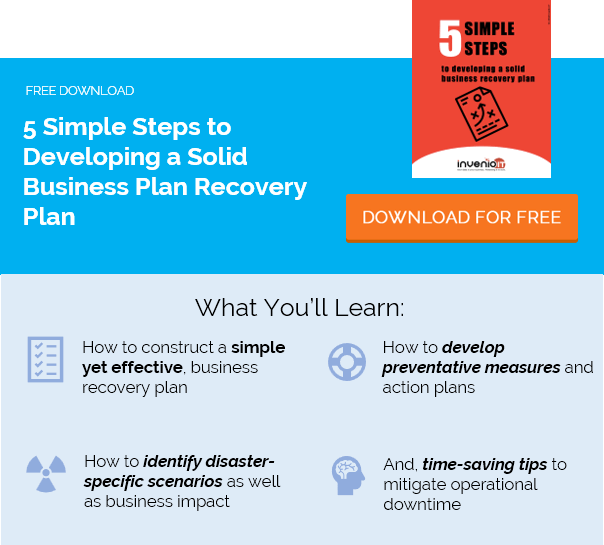 Your recovery team (and all other employees) need to know what to do after a major disruption. Otherwise, the recovery will become a big, disorganized mess. Make sure your recovery protocols are clearly spelled out, well in advance of the storm. Don’t take anything for granted. Create specific, step-by-step instructions that should be followed by each recovery team or department. All of the disaster prevention tips above should already be outlined in your business continuity plan (BCP). If you don’t have one, now’s the time to create one. Your BCP is the crucial document that outlines the company’s risks, potential losses from a disaster, preventative steps, technologies and protocols for recovery. A business continuity plan helps to ensure your business is adequately prepared for any form of disaster. Every business needs one, whether you’re located in a hurricane-prone area or not. You don’t have to guess how a hurricane might disrupt your business. Numerous storms over the last decade, like Harvey in 2017, provide clear examples of the destruction that can happen. Water-soaked walls, ruined equipment, shuttered businesses, employees who lost their homes. Thousands of companies were affected by Hurricanes Harvey and Maria last year, and many never reopened their doors. Their stories should serve as proof of the importance of comprehensive disaster planning at every organization. Learn more about today’s best data backup and business continuity solutions for protection against hurricanes and other disasters. Request a free demo or get in touch with our business continuity experts at Invenio IT. Call (646) 395-1170 or email [email protected].